A few weeks ago we shared the news that the Orcalight Seawolf had been upgraded. The original single battery canister and light head was returned to Shane at Orcalight for modifications. A second light head and improved batteries were in the upgrade and the intention was to improve the coverage of light when working with a fisheye lens. The addition of a second light head could not compromise the burn time below 60 minutes duration. A tall order pushing engineering to new limits. 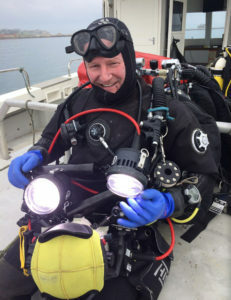 An opportunity to test the Orcalight on a Deeper Dorset project in Portland Harbour arose. In 6m of mucky water the target in question remains a bit of mystery but the resulting model proved beyond doubt the light worked: Even coverage without cranking the lights up to full power and 100% of the images aligning first time. The new lighting kit has exceeded expectations. The spread of light works well and there is more than enough lumens to keep the camera happy in the darkest of places with ISO settings leaning towards no noise and the auto focus lens making sure every image was sharp. Orcalight really have delivered a great bit of kit. There is a good chance the Orcalight will be used in anger very soon on a target in 45m of English Channel gloom. This entry was posted in Diving, Orcalight, Photogrammetry and tagged 3d model, orcalight, photogrammetry, scuba. Bookmark the permalink.